Industrial mixers are designed to mix or blend materials to form a homogeneous end product. Typical applications are found in the worldwide food, chemical, pharmaceutical, plastic and mineral industries. Depending on the application, such mixers work at different process temperatures and operating pressures. Depending on the ingredients used and the setup of the mixing equipment, industrial mixers can be applied for a variety of processes such as dry blending, paste mixing for high viscosity products as well as for emulsification, particle size reduction and homogenization. Industrial food mixers from amixon® meet a growing market with increasing demands as to convenience, quality and specific characteristics of the end product. They are the result of decades of experience and are designed to integrate with any production environment. Following the increasing demand for maximum efficiency, they combine fast operation with superior reliability, availability and service friendliness. They also feature the mechanical, electrical and communications interfaces for seamless integration into modern production control systems. amixon® industrial mixers used in the pharmaceutical or food & beverage industries conform to the GMP standards on demand, referring to the production of drugs and foods. This not only requires the use of materials that will not interact with the process media used. It also requires a seamless design characterized by smooth surfaces that not only prevent any accumulation of residues of the process media, but also supports easy maintenance and effective cleaning for fast and efficient changes between different products. Industrial food mixers can be adapted to a wide range of raw materials and end products. They are used whenever different types of raw materials in powder or granular form need to be turned into a homogeneous mixture meeting precisely defined quality specifications. They also mix products in dry and liquid form to form an end product characterized by a specific viscosity to meet consumer expectations. Especially in the worldwide food & beverage industry, multiple industrial mixers are set up to form complex mixing plants designed for high-speed serial or parallel production. Depending on the plant layout this usually requires combined positioning and linking of individual mixers. 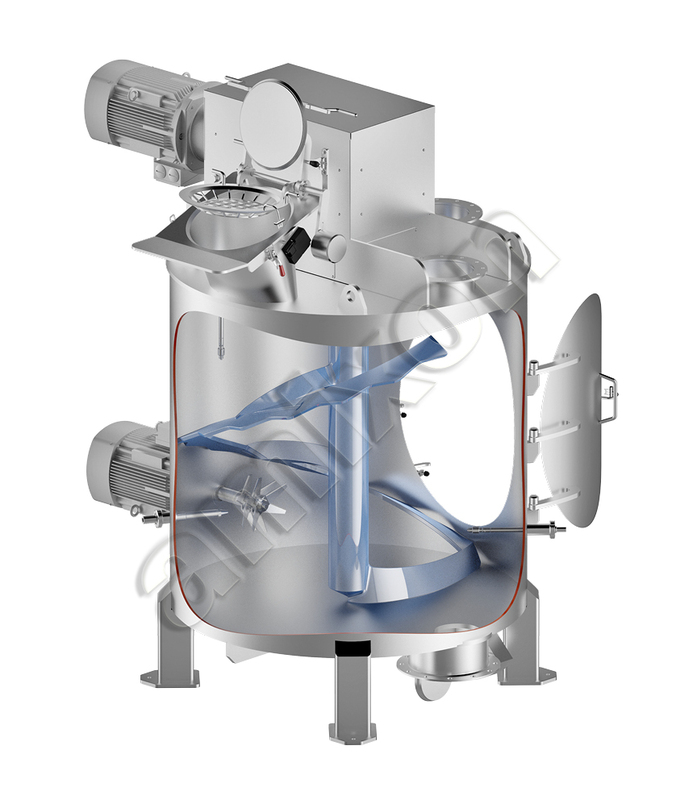 Industrial food mixers from amixon® stand out for their highly compact vertical design. Using natural gravity, this allows an easy flow of products without the need of costly piping and pumping equipment. It also allows easy cleaning of the mixing equipment, which is usually done from top to bottom. Like all amixon® mixers, blenders, dryers and reactors, the industrial food mixers are exclusively made in Germany. We insist on manufacturing especially all key technologies in-house at our product design and manufacturing facility in Paderborn (besides drives with transmissions and motors). This also includes the design of mixing shafts and blades. Due to this high production depth, amixon® not only offers outstanding technologies but is also able to ensure constant quality for superior reliability and performance. Industrial food blenders from amixon® are available in a variety of models featuring specific characteristics and technologies. Our application engineers are able to develop application-specific solutions tailored to the specific set of requirements of our customers. amixon® offers comprehensive customer support from consultation all the way to on-site assembly and implementation. At our worldwide pilot plants located in specific key markets, we provide a variety of mixing and blending equipment with. This allows us to test and demonstrate any customer-specific mixing, drying or reaction process under real-life production conditions. Following the demands of a busy yet health-conscious world, the food & beverage industry combines convenience with high quality and nutritional value. Dry soups made from dried, ground fruit, spices etc. Baby food from dry milk derivatives, micronutrients, vitamins, stabilizers, etc. Adhesion and agglomeration of particles to roundish fragments, scabs, prills or pellets. Inter-particular bridging can occur through melt adhesion, reaction, crystallisation, dipoles or hardening. Compared to finely dispersed materials, grain-enlarged materials flow better, are better suspendable, soluble, sinkable and pressable. Moreover, agglomerated materials are less at risk of segregation. Grain agglomerations with high density are often called granulates, pellets, prills or scabs. “Agglomerates” usually means grain agglomerations with large porosity, low density and good solubility. amixon® can realise gentle agglomeration up to build-up granulation with high energy input. Mixing / Deagglomerating is also random and results from the flowing and swirling of the mixture at high velocity. This operation is combined with high energy input. Primary particles, which have a tendency towards agglomeration or aggregation in smaller grain sizes, can be de-agglomerated by rubbing and crushing. In practice, the deagglomeration takes place by shearing, impact loading and friction (cutting rotors, HighShearBlades, dissolver, milling machines). amixon® has patented smizers and rotor-stators. The achievable mixing quality increases with increasing disintegration of the individual components. The mixing quality describes the equal distribution/ homogeneity of the components. amixon® guarantees technically ideal mixing quality, which cannot be improved in practice! Distributive mixing means the distribution or adsorption of one in/ beside another component. Dispersive mixing is random and results from the flowing and swirling of the mix. Separation of adhesive liquids during mixing. Depending on the type of energy input, a distinction is made between infrared drying, contact drying, convection drying and friction drying. Vacuum excitation lowers the boiling point, which promotes vaporisation or sublimation. Chemical reactions in the reactor can be promoted through pressure, temperature and mechanical energy input. amixon® can realise ideal reaction control and drying. Coating is a special method of grain enlargement. Primary particles or granulates are encapsulated by a different material like a film. The coating can be a micro-fine powder, a liquid or a solidified melt. Coating can be used for protecting, rounding off, inerting or hydrophobising of sensitive bulk materials. amixon® can realise gentle coating up to mechanical alloying.